It has to be complicated. Or perhaps it is simple. The relationship between a financial advisor and a client who happens to be an accountant includes issues which simply don’t come up when an advisor meets with someone who is, say, a physician. Doctors know what they know, which is not the same thing as what financial advisors know. Accountants, on the other hand, know an awful lot about some of the things financial advisors know about. After all, many investors use an accountant as their primary financial advisor. Spectrem’s new Professional Series examines the investment behaviors and attitudes of investors from three separate professions – doctors, lawyers and accountants. Each of these occupations, usually combined in Spectrem research on affluent investors, is a segment of individuals with similar mindsets towards investing, finances, and advisor usage. But while physicians and lawyers are smart and use advisors to augment their portfolios because they understand the value of working with specialists, accountants have a different view. While they may not have the same expertise in investing knowledge, accountants are similar to advisors because they are responsible for making the most out of their client’s financial pictures. Spectrem’s research into advisor relationships shows that some investors use accountants as their primary advisors. Seventy-nine percent of Millionaires with a net worth between $1 million and $5 million use a financial advisor, and 13 percent consider their accountant their primary financial advisor. That’s the third-highest percentage among Millionaires, behind Full Service Broker (29 percent) and Independent Financial Planner (15 percent). But accountants are not the same as investment advisors, and they seem to know that. According to the Spectrem research on accountants, 79 percent use a primary financial advisor. Oddly, perhaps, 5 percent of those use another accountant to serve as their primary investment advisor, but 42 percent use a Full Service Broker. Compared to other investors, accountants are more likely to be their own advisor; 41 percent consider themselves to be Self-Directed investors with almost no contact with a primary advisor, while only 32 percent of Millionaires make the same self-description. Accountants also consider themselves to be more knowledgeable about investment strategies than Millionaires. Ninety-one percent of accountants call themselves knowledgeable or very knowledgeable, compared to only 85 percent among investors from other occupations. So why would accountants turn to financial advisors when they can perform many of the same tasks themselves? There are obvious in-house advantages to a financial advisor working for a provider firm with the technical infrastructure to perform some investment tasks, but some accountants admit they want to deal with someone more expert than themselves in investment strategies. “I want to learn more about investing, but in the interim, I at least want my money to be able to work for me,’’ said one accountant interviewed for the qualitative portion of the Spectrem report. There are other areas of the study that are unique when considering the relationship between advisors and accountants. A surprising 57 percent of accountants find the fees an advisor charges to be expensive, although 34 percent say they do not worry about the cost of an advisor as long as their portfolio continues to grow. That makes sense, coming from an accountant who charges fees for their services similar to the way a financial advisor does. Accountants are less likely to be satisfied with the performance of their advisor, although that is more true of accountants with a net worth below $5 million than those with a net worth above $5 million. 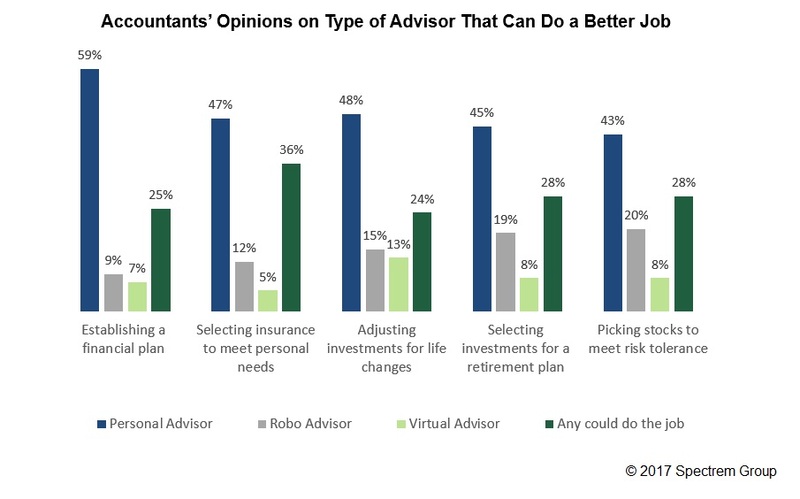 It is also weirdly revealing that accountants hold robo-advisors in higher regard than do other investors. Considering the proliferation of robo-accounting services, one might expect accountants to not engage with robo-advisors. But accountants often consider robo-advisors to actually do a better job than human investors in some wares. Just as there are different types of advisors, there are different types of accountants: some who do work on investment strategies and some who do not. Advisors working with an accountant needs to verify the knowledge the accountant has in areas of investment to better serve that client, having a better idea what the jumping off point for conversations would be.